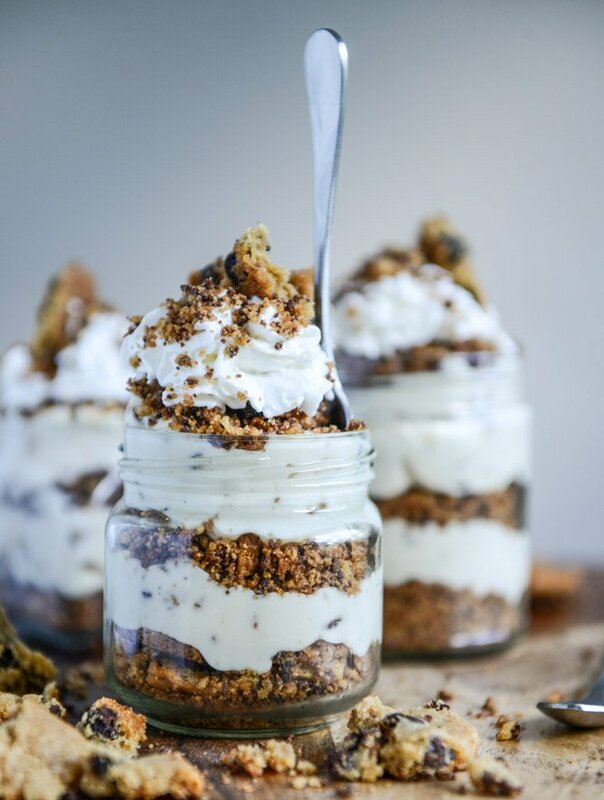 Easy Chocolate Chip Cookie Cheesecake Parfaits. A big birthday day that is. Someone in this house has a birthday today and it’s not me. And it’s a BIG birthday. A really big one. Two weeks ago I asked him what kind of dessert he wanted for his birthday. Well, scratch that. Two weeks ago I said, if you could have any dessert in the world, what would it be? Like what is your all-time favorite dessert on the planet? He looked at me like I was nuts. Apparently not everyone loses their mind over food. So I was like… okay, forget that. I’m just trying to make something for your birthday (well, your FAKE birthday, like your blog birthday, since I have to make the recipe ahead of time to post ON your birthday, such is life) and wanted to know what your favorite dessert in the universe was? Perhaps I should know this after five years of marriage. And I actually do know it. But I’m such a scatter-brain, lack-of-decision-making-and-constantly-wanting-the-new-favorite-thing woman that I was hoping for a new answer. I didn’t get it. But I got close. And all I thought of was… chocolate chip cookie cheesecake. YES. I knew it couldn’t be real cheesecake though, because who has time (I definitely do but like to pretend that I don’t) to do all that water bathing and cheesecake cracking stuff? Plus, I love eating little things out of jars and I knew he’d really want the actual chocolate chip cookies IN his cheesecake. I though they’d taste best if they still had a bit of crunch and were literally just – crushed – into the cheesecake. This is a ridiculously easy (and borderline embarrassing) recipe in which you just whip up some no-bake cheesecake and crumble up chocolate chip cookies. It’s up to you if you want to bake your own or buy them or convince somebody to make you a batch. The little cookies are a makeshift graham-like crust, but with bigger pieces, more texture and lots of flavor. The parfaits are, in a nutshell, super fun to eat. I asked the birthday boy what he’s learned in forty years and while it took him a while to think about it, one of his responses was, I don’t need to have meat with every meal when that meal includes brown butter. I think that sounds about right. HAPPY BDAY EDDIE! In the bowl of your electric mixer, add the cream cheese and mascarpone. Beat on medium speed until the cheeses are mixed and slightly creamy, then drizzle in the condensed milk with the mixer still going. Add in the vanilla extract and beat the mixture until it is creamy and smooth, scraping down the sides if needed. Take 10 of the chocolate chip cookies and either add them to a food processor or place them in a resealable plastic bag. Pulse (or crush) the cookies into small pieces. You don’t want them to be as fine as graham cracker crumbs – but you still want them crumbly. Having some larger pieces in there is okay too. Take a few spoonfuls of the crushed cookies and stir them into the cheesecake mixture. I’d say about 1/4-1/3 cup. Take 4 (6-ounce) jars and add a tablespoon of two of cookie crumbles to create a “crust.” They aren’t going to be as solid as graham crusts, but just layer them in there. There is no rhyme or reason to how I layered the parfaits – I simply added some cheesecake layer on top of the bottom crust, did another layer of cookies, another layer of cheesecake, then one more layer of cookies. Place in the fridge for 2 to 4 hours – just until the cheesecake sets. Remove the jars from the fridge and top them with a little whipped cream and extra cookie crumbs. Break apart the remaining cookies and stick the pieces in the whipped cream. Serve! These actually stay fresh in the fridge for a few days – cover them in plastic wrap and skip the whipped cream until right before serving. The cookies get slightly soft, but they still taste delicious. Oh and P.S. last night we sat on the couch wearing face masks… to prepare for birthday festivities I guess? Yes, I said we. What is this life? 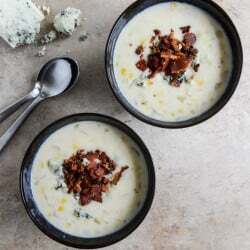 Cheesy Corn Chowder with Bacon + Gorgonzola. This is just so divine!! I love a no-cake birthday celebration!! Happy Birthday to your better half, Jessica!! Now that’s a dessert. The fact that it’s so easy is irrelavent! It’s got to be delicious and that’s all that matters! Beautiful photos as always. I hope he had a great birthday! This is such a fun birthday treat!! LOVE the cookies in there! These are right up my ally. Easy and delicious! Gonna give them a try. Where did you get your cute little jars? This sounds so amazing, i am going to give it a shot. I bough extra mascarpone for my tiramisu. I can’t get over how amazing these sound. I’m drooling! Yea for birthdays! And face masks lol :) These look stellar! Yummy! I love how easy these are to throw together with all the great components of a more complicated dessert. First of all, LOVE his response. Too funny. And this is like me trying to make treats for my fiance. I’m super excited and mentally preparing for days, then when I ask what he really wants, he just rolls his eyes and tells me he doesn’t really care and that he doesn’t like sweets that much. i shoot him a look that says “pick a treat or die” and then tell him exactly how excited he should be about his birthday and the treat that he chooses for that day. It’s hopeless. Happy Birthday!! This is a great treat to celebrate. Made these for my hubbies birthday today (cake will be had next weekend at a belated birthday party) and he loved it! Since early September I began to take a tour of all network blogs that suggests me something. It’s my personal way to show all I like. I have linked your blog in my latest publication. Everything is properly referenced. Congratulations for your work. Thank you very much. Oh my. I love ALL of the ingredients. So will be making these. Thanks for the recipe! Pingback: Sernikowy deser | L.E.D.D. Pingback: Cheesecake toetje | L.E.D.D. Which chocolate chip cookie recipe did you use? I love the idea of a graham type cookie crust, sounds delicious! Love this…where did you get the jars?